Nathan Fox, distinguished university professor and acting chair of the department of human development and quantitative methodology in the University of Maryland's College of Education, was named to the American Academy of Arts and Sciences, one of the nation's oldest and most prestigious honorary societies. For close to 30 years, Fox has pioneered research on children's social and emotional development. 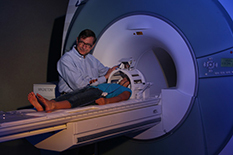 He conducts long-term studies of young children that provide insights into their cognitive, social and emotional growth by employing brain imaging technologies such as functional magnetic resonance imaging (fMRI) and electroencephalography (EEG). Fox and the researchers in the Child Development Lab study developmental process through linking behavioral observation and to the physiological response in the brain. Some of Fox's larger studies examine how infants learn about the physical world around them, how early temperament influences child and adolescent development, and the role of cognitive processing in the presence of anxiety and psychopathology as adolescents transition to young adulthood. One of his longest running projects, the Bucharest Early Intervention Project, examines the effects of institutionalized care on the cognitive and emotional development of Romanian orphan infants and young children. With his election to the American Academy of Arts and Sciences, Fox joins some of the world's most accomplished leaders from academia, business, public affairs, the humanities and the arts. The American Academy of Arts and Sciences is also a leading center for independent policy research. Members contribute to Academy publications and studies of science and technology policy, energy and global security, social policy and American institutions, and the humanities, arts and education.